Get ready to bite into a super soft slice of sandwich bread. Made without grains, of course! 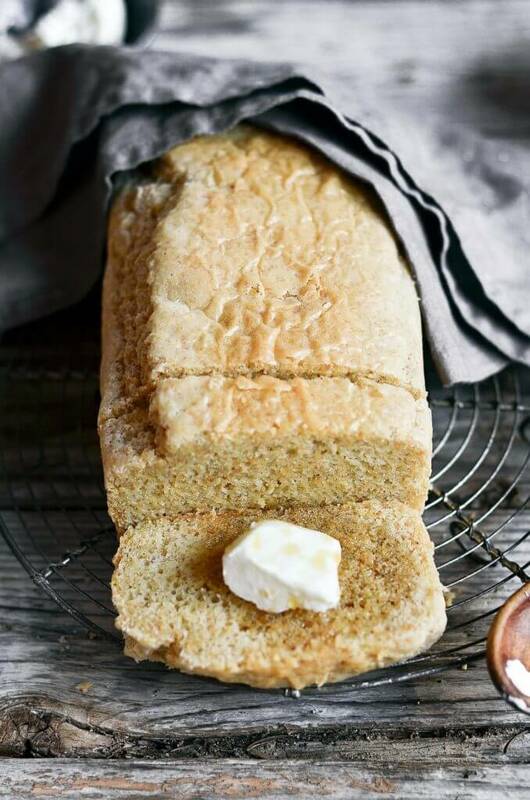 This loaf of gluten free bread is made in 5 minutes and then it’s in the oven! Plus, it tastes like legit sandwich bread. Grain free, dairy free, and healthy- this bread loaf will disappear fast. It was a hit in this house. And I hope you love it too! This 5 minute bread literally blew my mind! Wanna know why? Well for starters, it is super easy to make! Only a few ingredients. Throw it in a blender (or food processor). Then bake in the oven. And after it comes out??? Well, that’s when the really good stuff starts happening! Like devouring slice after slice:) This bread is so incredibly soft on the inside and has a moist texture like a loaf of homemade sandwich bread. Back when I used to eat wheat, once a week my family would buy homemade loaves of bread from a local baker. It was heavenly and filled with whole grains and amazing yeasty flavor. The texture of this bread reminds me of those soft loaves of bread. So, I thought I would share the yumminess. Enjoy! Healthy, gluten free 5 minute sandwich bread. Grain free, paleo, and soft. Great for making sandwiches or slathering in honey butter! Serve with honey butter or make a yummy sandwich! I made a delicious pesto tomato open face. And it was divine!! In a blender or food processor, combine all of the ingredients for the bread. Pour the batter into the loaf pan. Bake on 350F for 35 minutes until golden on top. 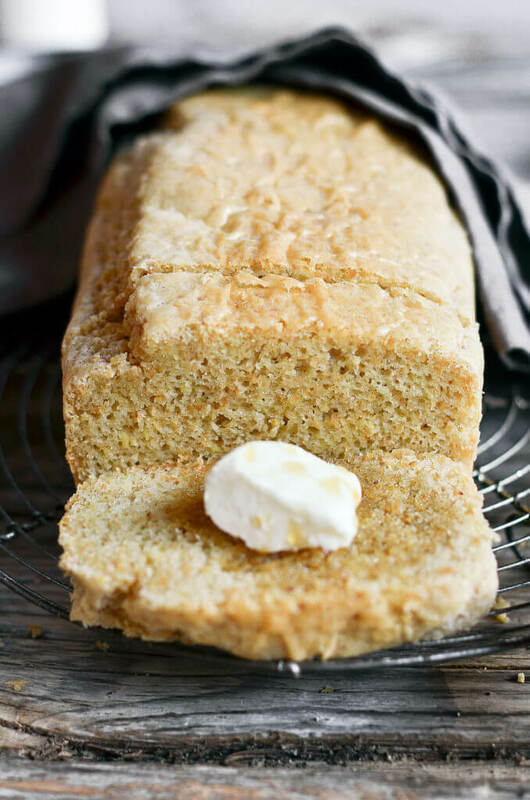 This is hands down the best gluten free bread I’ve tried (paleo and non-paleo alike)! I used ground chia seed in place of the flax, as it was all I had on hand. It wasn’t quite as pretty as yours, but tastes wonderful. Thank you so much for sharing this recipe! Great idea with the chia seeds. Thank you for sharing that tip! This is hands down the best gluten free bread I’ve tried (paleo and non-paleo alike)! Tastes just like regular bread. Thank you so much for sharing! Oh I’m SO happy you loved it!! Is the serving size for the whole loaf? This bread is so so good! I love that it doesn’t have Cassava flour, which upsets my stomach a little. It was so easy and the recipe is also pretty forgiving. I had a crazy two year old (who I thought would like to “help”) and an infant while I was making this and ended up spilling some of the flours and I didn’t measure very accurately and it still came out amazing! Thank you for the recipe! Is it possible to use a gluten free flour mix, or does that change the consistency of the bread? Hey Jamie, I am not sure- you could try it for sure! I haven’t tried that before, but I’m always up for an experiment:) Let me know how it turns out! I forgot I actually had arrowroot on hand and not wasting the almond flour (22$ where I live) I subbed tapioca. I also don’t like flax at all so I subbed tapioca flour for that also. I also had only three farm eggs – one was pretty big though lol. I also make my own 1-1 ratio baking powder with baking soda and cream of tarter. It turned out great! Such an amazing crust crunch and it has that spongy texture that all the other paleo breads don’t. It’s soft, light and spread on with Kerrygold salted butter!!! It’s got the slightest hint of sweet. Can’t wait to make my paleo strawberry jam for this! Also excited about applegate lunch meat with this bread for sandwiches! This will be a staple for us (im allergic to preservatives). AMAZING!! I used coconut flour instead of arrowroot (cant have arrowroot). It still turned out really well but needed to cook about 20 min longer. So delicious I don’t even need to put anything on it! Hi I just lost 29 lbs and looking for a healthier choice bread I’m really wanting to try your bread but really scared of the calories. Is that per slice or whole loaf? Is there any other flour I can substitute for arrowroot? Hi Nicole! Yes, you can use tapioca flour. Love this bread! How do you recommend I store it? I have tapioca flour. can i use that instead of arrowroot flour? Also can I use coconut sugar instead of honey and if so would i add the 2tb of coconut sugar? I can’t wait to try this! Thank you for the recipe! Can you tell me what size loaf pan to use? HI Jamie 🙂 This bread is made in a 4″ by 8″ load pan. I tried this recipe yesterday, it turned out pretty good, I liked that it doesn’t brake when cut, it was easy to make toast with. I wish I would use a smaller loaf pan (5″ x 9″ ) my loaf was flat. Would this recipe work with less eggs? I could taste eggs in it. Hi Valentina, You could try it with less eggs. Let me know how it goes! 🙂 You can totally bake it in a smaller loaf pan. I LOVED THIS BREAD!!! I NEED TO KNOW THOUGH THE NUTRITION FACTS IS THAT PER SLICE OR PER LOAF? I LOVE THIS BREAD! THE NUTRITION FACTS ARE THEY PER SLICE OR ENTIRE LOAF? Oh so glad you love it!! It’s per slice. Alright. So I saw this recipe yesterday, and knew I had to make it- even on a weeknight. Blender bread = so so easy (thank you!) Long story short, we’ve already eaten the whole loaf. My husband made awesome BLT’s for dinner, my toddler helped himself to a couple after dinner pieces. 😀 THEN. This morning my husband used the remaining slices to make open face breakfast sammies… runny egg and all. I did bake the loaf for quite a bit longer than you posted… but I’m pretty sure that is a reflection of our sad oven more than anything else. The bread has an awesome rustic texture… I’m going to try bruschetta with it next!! We did give each slice a quick fry in bacon grease to “toast” right before serving. Sidenote, I’m 6mo pregnant… so 2 full BLT’s is totally the norm for me right now 😀 Anyway, THANK YOU! This is my first time landing at your site… and I can’t wait to explore more of your recipes!! Thank you so much! This was delicious, didn’t crumble and fall apart like most g.f. breads. I brought it to my Bible Study group, one gal is on the Paleo diet and I am gluten free, two gals can eat anything. They all loved it. It is so easy to make, again, thank you so much for posting. I’ve already shared the recipe with two of the gals in the group. I am just worried a bit about the calorie intake. Calories per serving 302? isn’t that a bit much? 12 servings 3628 for the whole bread? I hope that is it a mistake. It does look gorgeous and I will try it but would also like to be sure regarding the amount I will be consuming. Thank you. The calories in this bread are from the healthy fats that actually fuel your brain and are burned as fuel, used as energy- the exact opposite of regular bread! The calorie count is completely un-harmful once you switch your mindset that healthy fat are good for you! 🙂 Hope that helps! Hi Kaylie! I’ve just discovered your fabulous blog! 🙂 I’m looking forward to baking this bread! I’ve recently been diagnosed with a coconut allergy (bummer). Could I replace the coconut oil with solid palm shortening (Spectrum) instead? Thanks! Looking forward to checking out your other recipes! Loving this bread!!! My mom really gonna like this and I’ll share this post with her she will definitely try it and I’ll let you know her comment once the bread is made. Hi Sara! Hmmm, I’m not sure- I haven’t tried anything else. I don’t think there would be a good sub for almond flour. I do have another sandwich bread recipe that is nut free and paleo- it’s in my ebook. It only takes 1/2 cup cassava flour! You can find it here if you are interested. https://paleoglutenfree.com/shop/quick-easy-paleo-breads/ Sorry I don’t have a good sub for the almond! I have a coconut allergy what could be used as a replacement? Trying this now but subbed the almond flour for coconut flour since I have issues with nuts. Just added more liquid. We will see how it turns out! I have read all the comments and I want to make this bread. I have to watch my salt, so is it a total of 12 slices and one slice is a serving? Thanks for the recipe, very eager to try it. Wow Cindy! Thank you SO much! That means a lot 🙂 So happy you enjoyed it! This is by far the best paleo bread I’ve ever made or eaten! I’ve tested so many recipes this past year and this is THE recipe I’ve been lookin for! Thank you thank you thank you!! My substitutions were coconut flour instead of arrowroot and honey for maple syrup AND regular gluten free flour instead of almond flour….some almond flour but not all. I also used 3 large eggs instead of 4 medium ones. With saying all of that I had to put more liquid in..it was too dense. Coconut flour needs more liquid. The bread tastes great but it’s too dense and didn’the rIse enough. Did the maple syrup vs honey or lack of one egg have anything to do with that density? I also don’the like the sweet taste in bread. Don’t eat any sugar so I am probably super sensitive to that taste. Your thoughts on the density, not rising enough and 3 large eggs vs 4 medium ones, in terms of making the bread rise more? Also would like a harder seeded bread. Do u have a recipe for that? I like hard breads. The taste is very good but not for breakfast or sandwiches. Not for me at any rate. Any suggestions? Thanks for ur help! Hi again 🙂 You can sure try it without the maple syrup and see how it turn out! I haven’t tried it so I cannot say for sure how it will turn out. Can you use an egg substitute for the eggs…like flax eggs or Neat egg? We have an egg allergy. Blew me away! I have tried about 25 different gluten free bread recipes that all went into the garbage. This came out looking exactly like yours in the picture and really tasted okay. Next time I’ll add a little sugar to balance the salty taste I had (my fault). You’re 21 years old? You go girl! Thank you Grace! Yes, 21 🙂 That is so sweet of you. I am so happy you enjoyed it! Just made this and it’s delicious with cinnamon honey butter!!! Thank you so much for sharing this simple and yummy bread recipe!!! I can’t have much sodium, so I left out the salt (since baking powder has quit a bit) and don’t miss it at all! Hmmm, what size pan did you use? If your baking powder has been in the cupboard for awhile, try it again with a new box and see if that makes a difference. Hi Kaylie! I’m a paleo eater & LoVe to bake- Just made this bread to the T with my 3 year old daughter & it’s brilliant & scrumptious & my lil’ Sage cannot stop saying “yum! !” There’s only one other bread recipe we have as our go-to staple, but now we have an ultimate 2 🙂 Thanks so much for sharing! This is my first time ever trying to make bread, let alone paleo and gluten free but it came out perfect and was so easy! And ….100% tastier than normal bread! Thank you for this recipe!! Argh! I’ve literally made 4 different recipes today for yeast free/gluten free breads, and every last one has been a fail. This one is in the oven as I write (please let it be good!). I had to sub a flour because hubby can’t have almond products so I will keep that in mind if it’s not perfect, but seems to at least have potential. I also only had duck eggs, which are large, so used 3 instead of 4 (can’t have chicken eggs either). I will let you know how it turned out! Thanks for the recipe! I’m not a big maple syrup fan and I have a co-worker who has her own bees and makes her own honey so I know exactly what I am getting. Have you tried subbing honey for maple syrup or has anyone you have spoken to tried honey instead? If so, what were the results? So glad I came across your website. I have a question, is arrowroot powder and arrowroot flour the same thing ? We only find arrowroot powder here in India. This bread is really good, and really easy. Have you tried it with a different oil? The coconut oil flavor really stands out. Hi Cindy, I haven’t, but feel free to- palm oil shortening should work just fine. Get the non -flavored coconut oil! Can I sub tapioca flour for the arrowroot? Its what i have on hand. Looking forward to trying this! Can this bread work for French dip sandwiches? Hi Tessa, I think it would be soggy… I do have a good dipping bread in my paleo bread ebook though. Hi! What size loaf pan did you use? I see now. You said it was a 4 x 8 loaf pan. Got it. Thanks a lot for healthy gluten free paleo bread recipe! Definitely will try it, but instead of apple cider vinegar i take conventional vinegar, nothing critical i guess. This bread is so perfect! Even my husband who hasn’t adopted my gluten free lifestyle loved it. Thinking about adding other things to it. Have you ever tried adding herbs or anything sweet? I feel like this could be the perfect recipe to turn into lots of different variations. Thanks! Just started eating paleo & found this. First bread in 2 weeks & it was amazing! I made this but didn’t have baking powder, so I subbed a little baking soda and greek yogurt instead. I also added some italian herb blend. I froze it overnight to take to camp. Now it’s perfect for a lunch or snack. I’m topping a slice with a little goat chesee, fresh basil, couple pieces of spring mix and a few cherry tomatoes on the side! It’s delicious! I also used olive oil. Hi Kalie, I’m anxious to try this recipe. How long does this need to be cooled before slicing? I know other gluten-free bread “finishes baking” while it’s cooling to prevent it from being soggy inside. We all love a nice warm piece of bread though and I don’t want to rush it! Thanks! Hi Susan, I eat this bread right out of the oven! No setting necessary. 🙂 Thanks for asking! Hi, Kaylie. It’s yummy! I just made the bread and ate 4(!) slices before slicing and freezing the rest. I followed the recipe exactly, using the same ingredients, measurements, temp. and baking time. I was surprised by the size of the finished loaf. It measured 3 7/8″ wide by 2″ high. I can’t imagine making a sandwich with slices that size! That said, it tastes great, and has a very good texture. At 35 minutes, I used a toothpick to see if it was baked through. The toothpick came out clean, but on slicing it, I think I’ll give it a few more minutes when I make it again. Thanks for the recipe. Hi Sharon, you can make this load in a smaller loaf pan and it will turn out taller! 🙂 Hope that helps. Glad you enjoyed it. WOW! Just took the loaf out of the oven…it was a weird grayish beige color because I used raw ALMOND flour and I really didn’t expect it to taste very good. I WAS PLEASANTLY SURPRISED…ITS DELICIOUS! Texture is very nice….moist and holds together well…not crumbly. And the flavor is wonderful! Tried it tonight, and it’s really good. Didn’t have ground flax meal, so I used the ground flax/chia that I had. Turned out great. I need a recipe that’s egg free too though…. any ideas? Love your bread recipe! I have been living Paleo for 20 months and have a growing collection of cook books but this recipe for bread is the best and easiest so far… Thank You! Wonderful recipe; made it today and will make it again. Two changes I had to make: having no golden milled flax, I had brown flax seeds which I ground in my food processor, (didn’t get as fine as milled). Also had no arrowroot, so used tapioca flour. Delighted with the results. It rose beautifully, had to bake it a few more minutes; the top was a bit less smooth than yours, and the texture is probably a bit different due to fax seed not being as fine as milled. It is still a keeper as it holds together well after slicing. My husband (not paleo) made disparaging remarks when I told him I was making paleo bread, but he ate two thick slices with butter before I snatched it away. He says it won’t hold together for sandwich, but I will make him eat his words tomorrow. Thanks for the wonderful recipe! When this is gone, I am going to make the multi-seed and nut bread. Oops; that seed and nut bread is on another site, however I am going to use this recipe as a basis for a carrot onion bread I used to make with ww flour and yeast. I will let you know if it works. Love the recipe. Excellent recipe. I doubled the recipe so it’s standard bread slice size. I baked it for almost 60 mins (fan forced oven 325F) checking it about 50 mins in. It turned out amazing. Very filling. One sandwich fills me right up. Each slice is about 240 calories if the whole loaf is cut into 16 slices. Thank you for the recipe. I will bake it several times a week. I wrap the bread in cheese cloth and inside a ziploc bag and keep it in the fridge so it will last longer. I’m Australian and I have to eat it with Gluten Free Vegemite. OMG… delicious. I use a Coconut Spread, basically taste like butter and smear vegemite on it and OMG YUM!!! I’m in love and found something I can keep around when I’m hungry on the spot. Thank you! I have a beautiful picture of the loaf. Too bad I can’t find a place to post on here. If you have one made with coconut flour, let me know and if it sticks as well together like Almond flour. I think the Arrowroot does the trick to sticking it all together. Hi! I made this bread today and the taste is amazing! The only problem with mine is that it didn’t rise even a little. Yours looks lighter, light not dense. Mine was very dense and even though I cooked it longer still darker and not quite cooked enough in the inside (but the outside was very done). The only thing I did different was I used Brown flax meal and 3 duck eggs because they’re bigger than chicken eggs. The taste was amazing so I would think if I could get it too rise a bit and not be so dense it would be perfect! Do you think adding an extra egg would help out maybe just a egg white since duck have a bit more yolk? Thank you for this recipe! I’m going to try again soon! Hi Carrie, I would try normal eggs and lighter flax to get the same results 🙂 Glad you enjoyed it! I am allergic to chicken eggs so I have to use duck or no eggs. I will look for lighter flax though. I just thought there was no difference but colour. I did try it with two of the duck eggs only using the whites. It came out a bit lighter but still dense. My 4 year old even loved it and that is a hard thing to do lol! I toasted in a pan with grass fed butter and put maple syrup on, he asked for it the next day (this is a child that hates breakfast food)! So good! Thank you! The bread was amazing! This was my first GF bread but I think its better than the whole wheat one I usually buy! looking forward to trying out some of your other recipes. Thank you for sharing. So it tastes super good, it didn’t rise much though (probably about 3/4 of a loaf pan ) and it cracked while baking. Any suggestions??? Hi Krista, what size loaf pan did you use? We made the mix as directed. We then mixed 1/2 cup coconut sugar and 1 Tablespoon cinnamon in a separate container. Pour 1/2 of the bread mix in the pan, followed by 1/2 of the cinnamon/sugar mix. Then put the rest of the bread mix in the pan and cover with the rest of the cinnamon/sugar mix. Then swirl with a knife. Great bread for having with stew or soup! Oh my goodness that sounds so delicious! Like a coffee cake! I might have to try this next. Hi Erica, the extra almond flour you used is what made it crumbly (almond flour is dry compared to arrowroot), glad you enjoyed it still! just tried this recipe out and i had to comment. It was DELICIOUS ! I have made others in the past that tasted too much like eggs, but this bread was a whole different story ! I followed the recipe to a T just cooked it longer since i have an older oven . Thank you so much for this recipe ! Relatively new to paleo. This is the 2nd bread recipe I’ve tried. Extremely happy with this recipe. I used brown flax seed. Soft, slight sweetness to it. I used my immersion blender to help with blending just cause I didn’t want to get the blender out…..will use blender next time .lol. super yum. My family and I love this recipe. I have made a few changes to suit our needs. We use 6 Tablespoons Cornstarch instead of the Arrowroot flour and Honey instead of Maple Syrup. I add the flax at the end. I also bake on confection for 40min. My girls are picky, so it has been hard to find something we all like made with ingredients we can all tolerate. Thanks for sharing this! I hope my changes can help others who can’t have arrowroot flour. Delicious! This was my first paleo bresad and I will definitely try more of your recipes! Easy to make and short cooking time. Hi, very interested but very nervous… everyone raves about GF bread they have made and everytime I make it – it tastes yuck! I have just quit carbs today so I would like a GF bread that is also low carb. I note that per serving is 23gm. Is this 1 slice or two? What adjustments would I need to make it low / nil carb? Thanks for your help! Did you ever notice a scent of ammonia in the bread? I noticed it when I was wrapping it to put it away. I am a pregnant paleo mom and my nose is super sensitive. Please do let me know if this is normal or I will have to throw it away. Hi Ariana, how long did it sit out before it smelled that way? This bread is amazing!! There is no way you can tell it is Paleo. The only issue I’ve had is after making it three times I’ve never gotten it to rise to be more than 1″ tall. Thoughts? I use a standard size bread pan. I swap Tapioca flour for arrowroot but that hasn’t ever affected other recipes when I swap it. How much is a serving? One slice? Yes, one serving is a slice. Love this! I also didn’t have Flax meal on hand (for once) and so I used Hemp Hearts. It was delicious! I love this bread, it tastes wonderful especially toasted when the crust gets crispy and crunchy. Good texture thing going here. My husband loves it too. However, mine did not rise. Was only about an inch thick. Any suggestions? Hi Mary, what size bread pan did you use? So the carbs per two slices is 23. My daughter is pregnant and has to quit sugar. Do these carbs turn to sugar? This was sooo good!! Thank you so much! This recipe is a lifesaver for my boyfriend’s lunches. He is always eating his lunch while driving and this bread is so yummy and allows him to continue eating sandwiches on the go! And it’s super easy to make! Thanks again! Hi Esther, you can probably get away with leaving out the maple syrup! I made this grain-free Paleo bread this morning! I followed the recipe exactly, and it worked perfectly. The bread is so delicious and satisfying!!! Thanks for providing this wonderful recipe!! The only thing wrong with this recipe is that the results are delicious. I immediately ate two slices before I saw the calorie content, so I am headed to the treadmill! Seriously, this is so good. I used to always make cornbread when I made chili. Tonight I am serving Paleo chili, and this incredible bread! Hi Kaylie, any experience using flax or chia egg instead of farm eggs? I have an effort allergy. I just made my first ever bread. Although I enjoy cooking, I have never baked anything in my entire 70 years. and coconut sugar. Blended the lot and ended up with a doughy mixture. but actually when I cut through it , it was like a bread. Next time I will use less salt. tried to buy some bread , but even though I live in the Sydney CBD , no one actually had any stock. So went on line and got inspired to give it a try. Thanks very much. I love love love love!!! This recipe. My only questions are how should I store the bread? And how long should it last without spoiling? I made a loaf on Sunday evening and kept it in an airtight container on my counter. By Friday morning (or maybe even before because I hadn’t eaten it for a day or so) it was ripe. Smelled like something was fermenting. Any tips? Maybe I should have stored it in the fridge. This bread is amazing! Thank you girl! You are so gifted, thank you for sharing your creations with us! Can you use an egg substitute and have it turn out still? We do paleo but the daughter does gf/vegan & would love to make it for her! Hi Danika, I have been experimenting and I did make an egg free version of this and it tasted delicious!! But it was flat- I just subbed for flax eggs (3 T water to 1 T flax for each egg, and let it sit) and added yeast to the warm water. I made this last night and frankly, I’m SHOCKED at how delicious this is! It reminds me of Ezekiel bread, which I love. Making it in the food processor helped it come together so quickly, which I always appreciate. The only adaptation I made was skipping the maple syrup as we are avoiding sweeteners. I found that it took about 30 minutes to cook through, but mine puffed up a lot in the center, and that’s where it needed the additional cooking time. It is definitely savory without any sweeteners, but I ate it this morning topped with a smear of cashew butter and bananas and found that the flavor balance was nice. Thanks for a great recipe! Most delicious Paleo bread recipes – completely free from all grains and wheat including with coconut flour bread, raisin bread, and more.. so yummmi…..
What can I say..very very good..thanks Kaylie…very pleased with this bread. Keep it up. I made this bread, subbing honey for the maple syrup, coconut milk for the water, and since I doubled the recipe for two loaves, I added 1/2 cup nutritional yeast for extra flavor. It’s amazing!!! Love the nutritional yeast idea, brilliant!! Hi Dee, I just checked into this and it looks like my nutrition converter was calculating wrong. Thanks! Wow!! I just made this tonight on a whim, and the family ate the entire loaf 🙂 This is the best bread recipe ever and super easy to make. Thank you so very much for this wonderful recipe!! Hello, have tried this once it was delicious. Just out of interest, why is the coconut oil solid not liquid and would it make any difference if it put into the rest of the ingredients melted? Omg this bread is to die for. My house smells fabulous and the bread is phenomenal!!! Can you freeze this bread? And also what side load pan do you use? I feel like my bread is flat in my 9×5 pan. Kaylie amazing gluten-free bread! Thank you so much, it’s delicious. I have been looking everywhere online for a simple and quick gf bread and randomly hit your site. I am so glad because I now have a go-to recipe for my bread. It is especially nice that the texture is just like wheat bread and also visually gives the same impression. Well done! How long do you think this bread will stay fresh I’d I can’t put it in the fridge or freezer? I’m going on a trip and I’m thinking of making this to take with me. Hi Nicole, it’s good on the counter for 3-4 days, but then I store it in the fridge. I just baked this recipe. Wowza! This is so good! Even my 3 year old loved it!!! We’ve tried it plain, with butter, butter and honey, and nut butter. So so good! I’ve tried a few other paleo/grain free breads and this is by far the best. It tastes great but what’s amazing about this recipe is ITS SO EASY. Being able to throw all the ingredients in a mixer and not having to fuss with whipping and folding in egg whites, etc is a perk. I made two modifications and it turned out well. Slightly melted raw honey in place of maple syrup and I doubled the recipe because I like the loaf to be close to a standard size (obviously adds a quite longer bake time but worth it). So glad you enjoyed this Tera! The first time I made this bread I didn’t have the flax so I subbed in ground Hemp Hearts. Yummm It was delicious, but a tad bit sweet. Ever since I have been making one loaf as the recipe says and one with the Hemp Hearts. I’m trying your paleo perfect sandwich bread. It’s in the oven as I write this. Diane – I don’t have arrowroot flour can I substitute tapioca and if so is it the same ratio? Wow….just made this recipe. Its positively delish!! Wow! This bread is phenomenal! I’m not even really a baker, but it was so easy and so fast and so delicious. I can’t get over the yeasty-tasting deliciousness of it. Thank you! How many grams constitutes one serving size or slice? Hi Jason, I am not sure. Thx for sharing healthy gluten-free bread recipe, i definitely add it to my cookbook! I found your post from Pinterest! I’m also gonna pin this post on my Pinterest board my followers will love it. Thanks for sharing! It was delicious! I’ve tried a few of your recipes now and LOVE them. This reminded me more of cornbread than sandwich bread but still delicious. I used half almond and half tigernut flour. It was so yummy. Thank you so much for this recipe! I have tried so many paleo bread recipes and this is the best one yet. My husband devoured half of it and he’s a very picky eater. I’m going to double the recipe next time so I can use my larger bread pan. I do have one question though. Do you think this recipe would work if I added bananas, or blueberries? I was thinking of doing that but wasn’t sure if that would effect the consistency. Hi Miranda, I don’t cook with corn flour so I don’t know. There isn’t really a good sub for coconut flour. You can use tapioca in place of arrowroot. Hope that helps! So this is really good. Even my non paleo husband enjoyed it. I have to say I’m very glad it’s a forgiving recipe though. I had some weird internet glitch and I started making this recipe but the ingredients were off so I reloaded my page and then the correct ingredients came up. But by then I had already put 6 eggs and too much salt. Still delicious! I used tapioca because i didn’t have arrowroot. Thank you for sharing! I’m allergic to almonds, is there a substitute flour I could use? So good!! I threw this together in 5 minutes like you said! Only ingredient I didn’t have was maple syrup, just used it all this morning! So I subbed 2 TBS raw honey! So good!! Can’t wait to toast this up with some avo in the am! Wow! This is the best Paleo Bread I’ve ever made. Thanks so much for the recipe. I didn’t even use a blender because I don’t have one. And it turned out all right anyway. Love it! The only bad thing about this bread is that I CAN’T STOP EATING IT! Lol. I’ve been without bread for two months. The first recipe I tried from Pinterest was a flax loaf that was a huge failure. This recipe was easy to make and turned out awesome. I used three eggs instead of four because I only had large/extra large eggs to choose from. It has the texture of banana bread so I originally thought it will be more of a treat vs a sandwich bread. I’ve been putting jams on it but then I saw the suggestion of pesto with tomatoes so I will be trying that next and will also try toasting it. Much thanks to the creator of this recipe and for sharing it! 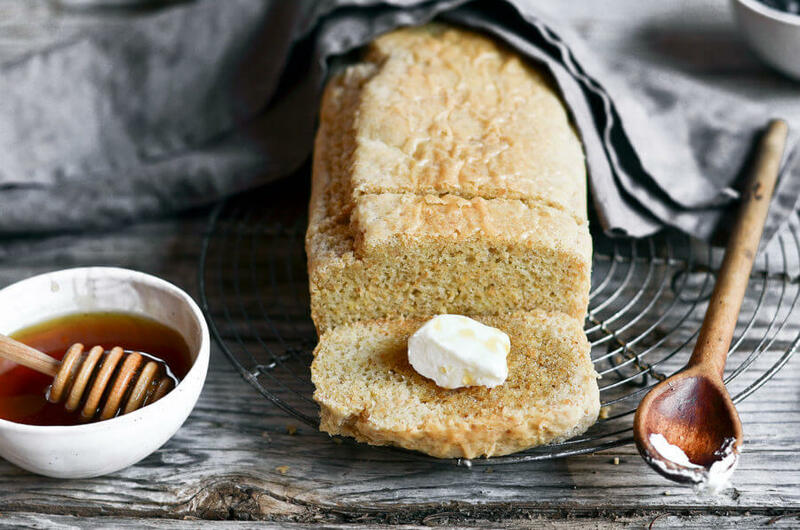 This is the best gluten free bread recipe I’ve tried! So glad I found this. It’s not crumbly, very bread-like, just a bit dense. I loosely followed the recipe and changed a few things. I omitted the maple syrup to make it whole30. I didn’t have arrowroot so I subbed tapioca starch per some of the comments and added some chia seeds as well. Since there was so much coconut oil in it, I plan on experimenting and using olive oil so it doesn’t have too much of a coconut taste. My husband didn’t really notice it though. He is the gluten free one and he’s very picky about his bread, but this got his approval! I added some almonds on top and garlic and Italian herb seasoning to give it a flavor boost. I had trouble with this in the blender, maybe because I don’t have a very good one, so I will just use a mixing bowl next time. Thank you for sharing! I will be telling my friends about this! I’ve been following a gluten-free diet for two years now. I don’t adhere to a strictly Paleo diet but I use a lot of Paleo recipes I find on Pinterest. This is the first time I’ve ever left a comment or feedback. After enduring many labor-intensive, gluten-free and Paleo bread recipes, I have found my go-to! This is SO simple with a WONDERFUL taste and texture! I don’t keep flax on hand so I use sweet sorghum flour (I realize that’s not Paleo but it works for me.) I also add a packet of quick rise yeast simply because I like yeast flavor. I turn my oven on the lowest temp and set the batter on top of the stove for an hour and it does rise nicely. There’s no need to wait if you’re not looking for it to rise. The hands on time is just as the recipe indicates-minutes! I also just realized that the Paleo casserole dish I had intended to make for dinner tonight (and have already made several times) is from the same source and is DELICIOUS and healthy, comfort food! Thank you Kaylie for the simple, fantastic recipes! made this today with 2 eggs and 2 flax eggs and otherwise followed recipe. amazing. I have tried 2 other recipes with almond flour and prefer this one. I put a smidge of low sugar raspberry curd on it. to die for! will make again. also sliced easily. wish I could have included a pic. it was. beautiful. Hi Wayne, about three days. So delicious! I could eat this whole loaf with butter or almond butter. Mine didn’t seem to rise as much as yours. I wonder what I did wrong? I love this recipe and I have one slight problem, during baking the top cracks on either one or both sides and puffs up, which crates a separation from the rest of the loaf. Still tastes great though. I’m wondering if it’s from either not mixing enough or mixing too much in the food processor or if there is something else I’m doing wrong? Not sure how I can send you a picture of todays load?! Thank you I just sent an email! It’s in the oven, but I have concerns. Batter very thick. There was no “pouring this batter”. more like “spooning out this sticky dough”. I even added a wee bit more water. The top is not smooth because it was like smoothing out nut butter. So, I’m afraid it’s too dense to rise. But still hoping it tastes good. this bread is fabulous! i made it in a larger bread pan, making the loaf a bit short. . . Next time, i’ll use a pyrex bread pan (smaller) so that the loaf is a bit taller. Wondering if i could make 1.5 of the recipe for a taller loaf in my bigger pan. . . so many things to try. Oh and my kids loved it! They thought it was banana bread even though it isn’t really sweet, i think the texture gave them that impression. I am thinking i could use this as a base for a yummy banana bread, adding a banana or two. I’ll let you know if i try that. Anywhooooooooo – this is a great recipe, the bread is moist but not weirdly and can be eaten warm right out of the oven! I also love that it has a fair amount of protein for my kiddos. They loved it with butter, almond butter and of course nutella! Thank you so much Jeanette! That’s so great to hear! 🙂 Glad you kids enjoyed it too. By far my favorite bread recipe! It turned out golden brown with a great flavor! Super easy and basic ingredients so you don’t have to run to the supermarket before making it. I asked my husband (not paleo or gluten free) to taste it and he thought it was good. That’s quite a compliment because he dislikes most gluten free/paleo things. Just a note, I’m at 9300 feet above sea level and it still raised and turned out delicious! Thanks so much for the excellent paleo bread recipe. My husband and I tried your recipe this morning for the first time. We halved the recipe and used a 3/8 pound loaf pan. We both enjoyed this bread very much! The taste and texture are excellent. What a lovely bread. Soo moist. Far exceeded my expectations!! I have trouble with honey and maple syrup. Can I use stevia? Yes Jerry, stevia works! Just use a few drops and maybe 2 tbsp. water. Would yourepeat what to do if you are replacing the eggs? Hi Bethany, I used flax eggs (1 tbsp flax meal + 2-3 tbsp water- for each egg). Let ie sit before and after you cut it to allow some of the moisture out! So glad I found your paleo bread recipe! Can’t wait to try it. This loaf looks perfect! Great for slicing and slathering with butter, or toasting for breakfast. Lovely photos too! I’m trying this bread recipe for the first time so I will let you know how I like it. It’s in the oven at the moment baking. Wow! I just made my first loaf and had my first slice! I’ve never made paleo bread before and it was fantastic! Almost TOO good, if you know what I mean! I made this last night and had it for dinner this morning and it was delicious! I subbed almond flour with coconut flour and it turned out quite dense. Any tips on getting fluffier like yours? Hi Layla, you can use butter or palm oil as a sub. 🙂 Enjoy! 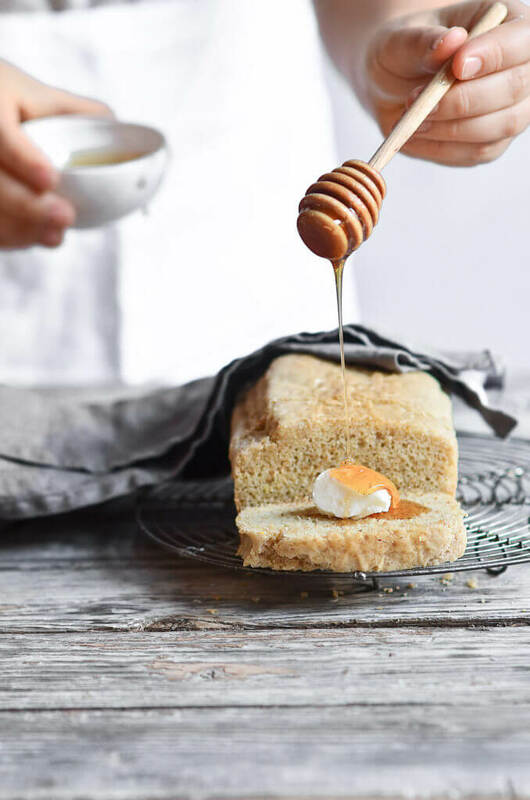 I’ve never left a review before, but can’t help myself because this gluten-free bread is to die for (figuratively). Although, I did make a couple of adjustments because I’m allergic to tree nuts and sensitive to coconut products. In place of almond flour I made my own cashew flour (added raw cashews to food processor and let run until as fine as I could get it without it turning into butter). I substitute the coconut solid for Spectrum Organic Palm Oil shortening. I was worried that it would taste eggy with 4 eggs, but went ahead and used 4 eggs and YEAH — not eggy tasting (to me). P.S. Cashews nuts is not a tree nut, it’s a legume. Great to hear Naomi, thanks for sharing! Correction to my previous message. Cashew nuts are a seed and are Paleo. This is by far the best gluten free bread I’ve ever made. So easy to make and perfect for sandwiches. Thank you so much Loanna! That’s so great to hear! This bread is exactly why I don’t eat grains! It is so yummy, I really would like to eat the whole loaf in one or two sittings! Hi, your recipes look great!! Can you please tell me what can I use substitute for coconut oil? Hi Jassi, you can sub coconut oil with butter or possibly palm oil? Made this bread. Turned out great! I did bake it a bit longer. Could be my oven. Love the good fat, high calorie coming from fat. Perfect. Since going sugar free a few months ago l did find it sweet with the maple syrup. Am going to use less next time. Absolutely loved it and have recommended it to many people already. I love the taste of this bread but I cannot get it to turn out looking like your video demo. It is so dense on the inside. I have made it almost a dozen times, sticking to the recipe…. only subbing tapioca for arrowroot. What can I try to make it fluffy on the inside and “bread-like”?? Any suggestions would be appreciated! Hmm, that’s so weird, because mine is always so fluffy! Is it cooked all the way? This bread is delicious! I’ve been searching for a good paleo and allergy friendly bread and this one is great. Thank you for sharing. Hello Kaylie, every morning I eat. Thank you for sharing! I was wondering if you had any other suggestions besides chia seeds to replace the flax? My daughter is gluten and dairy-free and has a very sensitive stomach. We are eager to try this since her bread is $8.99/loaf! Thanks in advance. Hi Gina, you could probably use a blend of 4 tbsp psyllium husk and 4 tbsp almond flour in place of the flax?? I haven’t tried, but it might work! Thanks for the recipe, I can’t wait to try it..
for the almond flour did you grind up almonds? and can I use tapioca flour instead of arrowroot? What is the reason for the flax seed having to be golden? I have some flax seed on hand that is not golden and wonder what the difference will be in the outcome. Thank you! OK I made it and it is yum. Very soft, slightly sweet but mine didn’t rise so much that I can say it a sandwich bread. Need tips? Best bread ever! My husband does not share our paleo journey but he ended up eating half the loaf. He’s in denial! Thank you for this recipe. Haha, that is so great to hear, thank you Sylvia!